Overview of the Hitman slot. This highly dramatic slot game is one of the most popular Microgaming slots. The Hitman character and brand is not a comic book per se, but often falls into the same category because it’s a series of video games and movies. Hitman is known for sophistication and darkness, which comes through in this three-bonus slot machine with themes of assassination and crime. 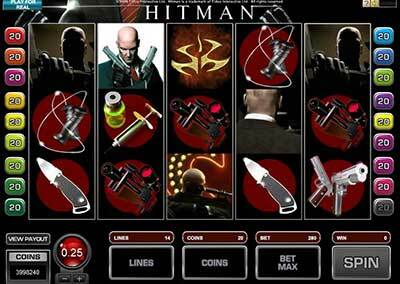 This slot was released in 2006 with permission from Eidos Interactive who created the Hitman game franchise. The games see Hitman, who has no name other than the number 47, assassinate a variety of evil figures from the underworld while slipping in and out undetected. The ‘silent assassin’ also made it to the big screen and it’s only fitting he has a slot game, which perfectly matches his world of mystery and big money. Let’s look closer at this mysterious character and the game itself. Hitman, also known as Agent 47 or just 47, originated in the video game Hitman: Codename 47. There have been over five games since, developing the series and themes within but always being about stealth. 47 is known for his skills of disguise and planning, getting close to targets without ever being spotted or leaving a trace. His unusual name comes from the fact that he is a clone, literally born to kill, yet deep within he has a rebellious and even compassionate side. The famous Hitman video games gave rise to two movies. The first was in 2007 and starred Timothy Olyphant, but the second in 2015 is a reboot starring Rupert Friend. These films portray other sides of 47, giving him a little more character and humanity. Both the games and movies show Hitman in an iconic black suit, with a bald head and barcode tattoo hinting at his clone status. The Hitman slot is not the best-looking slot game, but it does have some very nice 3D animation. They use the themes of the games, drawing on black and red colours and shiny steel weaponry. All the symbols used by the slot are from the game or relate to it. These include all his signature weapons; a knife, a syringe, a garrotte, a sniper rifle and of course the dual silverballer pistols. An envelope of cash is a fitting symbol too, for both 47’s deadly contracts and the fact that you’re out to win cash on the slots! There are also four symbols showing the Hitman himself in different poses, one showing the barcode tattoo, so clearly this game was designed by people who know 47 well. This slot game has two bonus rounds, with one showing the curved logo that fans will instantly recognise. The Contract Bonus shows us the ICA laptop which fans will also know, standing for International Contract Agency. The information pages actually have some nice artwork of 24 in his glory, too. Hitman is a 5-reel video slot and has 15 paylines, which means you can win in 15 different ways. This is less than other slots but you can opt to pay more coins per line to make bigger stake combinations. You can see the paylines by clicking the numbers on the sides of the reels. You need 3 matching symbols from the left to the right, along those lines. The game has a minimum bet of 0.01 and a max of 0.25, before multiplying. There is a Hitman with pistols symbol that is wild and also expands if it lands on 2, 3 or 4. This can really unlock the wins. There are three bonuses to watch out for, starting with a free spins bonus offering 18 spins with a 2x multiplier. This is triggered by the 18 certificate. The Insignia Bonus triggers when you land the famous Hitman logo on reels 1, 2 and 3 and you simply pick an insignia to get an instant prize. Lastly, the Contract Bonus is triggered by the laptops on 3, 4 and 5 and here you choose a high value target, just like the video game. You also choose a weapon to complete the contract with. Choose well to win up to 270,000 coins!